The moringa (Moringa oleifera), a tree native to sub-tropical and tropical regions of Africa and Asia, is often hailed as the ‘miracle tree’ – partly because the tree is so easy to cultivate (and grows extremely quickly), and partly because of the myriad health benefits that have come to be associated with the powder made from its leaves, which are often compared to an (organic) supermarket on a tree, thanks to their exceptionally high concentration of vitamins and minerals. Yet, whilst moringa is most definitely a rising star that’s currently grabbing our headlines, it cannot simply be dismissed as just another ‘flavour of the month’. Indeed, the moringa was revered for its beneficial properties as long ago as 150 B.C., and virtually every part of the moringa tree, including its flowers, gum, bark, roots and seeds, have been harnessed in Ayurvedic medicine for centuries. The Romans, Greeks, and Egyptians also prized moringa and used it to protect their skin or cleanse their drinking water. Since then moringa has been the subject of countless scientific studies conducted by more than 200 universities and research centres, such as the John Hopkins School of Medicine, the World Health Organization, the Center for Disease Control, and the National Institutes of Health. Today humanitarian organisations even promote the cultivation of moringa in poverty-stricken or developing nations as a valuable source of food and nutrition, and moringa powder, the antibacterial, antiviral, anti-fungal, antidepressant and anti-inflammatory superfood supplement, has become an increasingly popular choice for those wishing to dramatically boost their vitamin and mineral intake in one simple and cost-effective serving. Moringa powder contains an impressive four times more calcium than milk and just 100 grams of moringa powder contains a whopping 30% of our recommended daily intake of this mineral. According to the NHS, calcium may also help to lower high blood pressure – high blood pressure or hypertension is known as the ‘silent killer’ as patients rarely notice symptoms. Some 30% of people in England have high blood pressure, which left unchecked, can put a strain on the arteries and heart and may lead to heart attack, stroke or kidney disease. In addition, moringa powder contains a large amount of vitamin E, which can lower the risk of cardiovascular problems by up to 50%. A 2008 study published in the ‘Journal of Ethnopharmacology’ indicates that moringa extract can significantly lower blood cholesterol and thus actively reduce the risk of cardiovascular disease. Its antioxidant properties are also believed to help protect our heart cells from the damage caused by free radicals. The NHS also believe that calcium can protect against colon and breast cancer, and findings published in the Jan. 17 issue of the Journal of the National Cancer Institute revealed that calcium ‘seems to protect high-risk people from developing the polyps that can lead to colorectal cancer’, whilst a number of other studies, including an early population-based case-control study in the Netherlands, suggest that women who consume relatively high levels of dietary calcium and fibre might have a decreased risk of breast cancer. Moringa powder also contains the antioxidant, benzyl isothiocyanate, which is understood to have both anti-cancer and chemo protective capabilities and moringa extract has proven effective against the lymphatic cancer, Burkitt lymphoma, ovarian cancer, and cancers of the pancreas, lung and oesophagus. Moringa powder contains three times more potassium than bananas and two tablespoons provides over 60% of our recommended daily potassium intake. Potassium is helpful in reversing the role of sodium, and just like calcium, may also help to lower blood pressure – in one major study of patients with high blood pressure, potassium supplements reduced their systolic blood pressure by about 8 points, and taking potassium is known to reduce the risk of heart attacks. And potassium helps to keep brain function normal – high potassium levels allow more oxygen to reach our brain, where it stimulates neural activity and increases cognitive function. A series of studies in the British Medical Journal indicate that a higher intake of potassium could cut the risk of stroke by up to 24%. As well as triggering abnormal heart rhythms, deficiencies in potassium can cause a drop in blood sugar levels, which is why diabetic patients are encouraged to keep an eye on their potassium intake. In addition to being absolutely vital for both scotopic (vision under low light conditions) and colour vision, vitamin A is especially helpful in treating skin disorders, such as severe acne, and combatting diseases caused by viruses, including measles, respiratory viruses, and even human immunodeficiency virus (HIV), the virus that causes AIDS. Scientific research on cellular immunity in mice, published in the Journal of Nutrition in 1987, concluded that a vitamin A deficiency is linked to a functional immune system defect. It has also been observed that stroke victims who enjoy high levels of vitamin A in their diet are less likely to die or suffer disabilities as a result. In fact, protein is an important component of every cell in our body – our hair and nails for example, consist largely of protein – and it is indispensible in our growth, replenishment of our blood supply, the healing of wounds and the replacement of dead cells. Protein also promotes healthy metabolic and physiological processes, strengthen our nervous and immunity systems, and where fat and carbohydrate food sources are not providing sufficient calories, is broken down to provide the fuel our body needs. There is growing evidence that eating a diet rich in protein could be beneficial for our heart too, providing the protein comes from a healthy source. The Optimal Macronutrient Intake Trial for Heart Health revealed that a healthy diet that replaced some carbohydrate with healthy protein was more successful in lowering blood pressure and harmful low-density lipoprotein (LDL) cholesterol than a similarly healthy, higher carb diet. Unlike fat and carbs, our body cannot store protein, which is why we must obtain a regular supply from our diet. Lack of protein can cause growth failure, loss of muscle mass, decreased immunity, weakening of the heart and respiratory system, and in some cases, even death. Lastly moringa powder possesses an incredible seven times more vitamin C than oranges or an impressive 220 mg per 100 grams. Many of us swear by vitamin C for the prevention of the common cold. Yet, according to a recent study published in Seminars in Preventive and Alternative Medicine, which analysed 100 studies over 10 years, there is a growing list of additional benefits now associated with vitamin C. The study’s lead researcher, Mark Moyad, MD, MPH, of the University of Michigan, states that ‘higher levels of vitamin C may be the ideal nutrition marker for overall health’ and that ‘the more we study vitamin C, the better our understanding of how diverse it is in protecting our health from cardiovascular, cancer, stroke, eye health and immunity, to living longer’. Unlike some vitamins, our body is unable to manufacture vitamin C, meaning that it must come from our diet. A deficiency in vitamin C contributes to a lack of collagen (a type of protein found in our skin, blood vessels, bones and cartilage) and causes a condition known as scurvy, which results in muscle and joint pain, lethargy, skin rash and bleeding and swelling of the gums. Moringa powder is a nutrient-dense superfood supplement that can be enjoyed by vegetarians, vegans, rawfood fans and indeed, all those who want to dramatically boost their vitamin and mineral intake. Moringa powder can be mixed into your daily smoothie, shake or protein drink for a quick blast of nutrients on the go, or used as an additional ingredient in your favourite rawfood recipes, including raw chocolate, cakes and desserts. 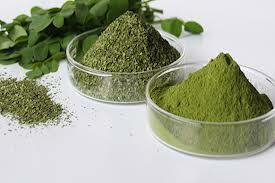 The post Moringa – more vitamins and minerals for your money! appeared first on Superfood blog - Healthy, Rawfood Lifestyle.